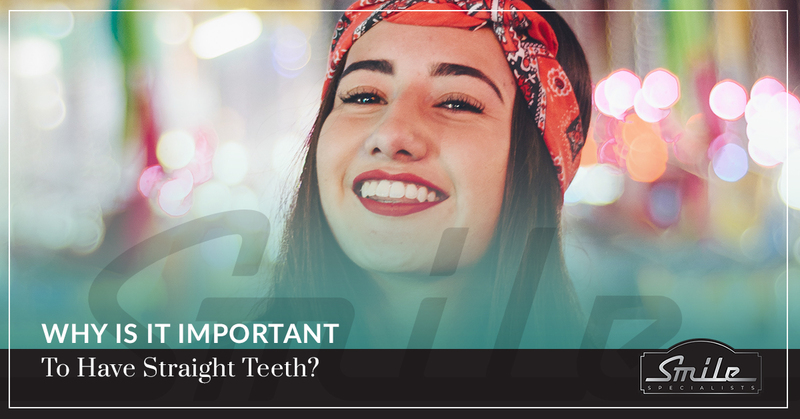 Why Is It Important To Have Straight Teeth? Though the science behind human attraction is a bit of an ever-evolving mystery, there’s no doubt that 99.9 percent of people see straight teeth as an attractive feature. Some people lucked out and were born with a mouth that will never require any work, whereas others will need to visit a cosmetic dentist at least once in their life. With orthodontics common in younger people and even braces for adults, there’s no doubt that society weighs a lot of value on having a nice smile. At Smile Makeover Specialists, we’re in the business of the smile department. It’s in our name! We truly believe that the smile is one of the single most powerful features of the human body, and that confidence and positive self-esteem is, at the very least, reinforced by a good smile. From both a physical and psychological perspective, having a straight set of teeth makes a lot of sense. Let’s look at a few notable reasons why it’s important to have straight teeth. Before we dive into the social aspects of having straight teeth, it’s important to touch on the physical aspects of your smile. In terms of maintaining good oral health, it’s easier to floss and brush your teeth when they’re not overlapping or spaced unevenly. Crooked teeth also give plaque more places to hide and get lodged between the tooth and gums, so having a straight set of teeth automatically means that you’ll enjoy better oral health and won’t have to spend quite as much time flossing or brushing. When you can’t bite down correctly in a way that human teeth were designed to do, you may have issues with chewing food or articulating your words correctly. It’s not uncommon for a number of speech issues to dramatically improve or even flat-out go away after a certain extent of oral reconstruction or cosmetic dental surgery. We all deserve to speak clearly and eat food normally, and our cosmetic dental services give everyone this chance. When you meet someone for the first time, your brain automatically processes many different stimuli, but you probably naturally gravitate toward their smile and their eyes. Some studies suggest that about one in three people immediately notice someone’s smile as their primary feature, so you’re more likely to establish a positive impression with a good-looking smile. As superficial as that sounds, it’s true — especially in American society. Feeling good about who you are and how you look is, no doubt, important to your overall happiness. A set of straight, pearly whites is a surefire way to go about each day knowing that everytime you smile, it’s genuine. How wholesome is that? Don’t let crooked teeth or an imperfect smile hold you back from the happiness that we know you deserve. Schedule an appointment for our cosmetic dentistry services for the best lifelong investment you could possibly make! Why Choose Smile Makeover Specialists?